The Internet and the World Wide Web have revolutionized the way we do research. Instead of spending hours combing library indexes and catalogs, making endless telephone calls, or traveling to far-off places, with a few clicks you can find an enormous amount of information on virtually any subject: government statistics, fast-breaking news stories, up-to-the- minute weather reports, sales catalogs and business information, radio programs, movies, music, and virtual art galleries and museums. Searching the Web for this information can be a challenging and possibly frustrating task. The Web will not always have everything you’re looking for, and sometimes the information you want is on the Web, but difficult to find. Keep in mind that even though the Web has billions of pages, most published literature is not Web-based, but rather exists in books and periodicals that are in paper form, or are located in fee-based databases. Librarians can help you determine the best sources to consult for the subject you are researching. Once you’ve decided the Web is the place to look, how do you proceed? Several major search tools are available; which one do you start with? The material in Chapter 2 of Searching and Researching on the Internet and the World Wide Web 5th Edition will help you decide. You might also be interested in reading Thing 5: Using the Web for Research. That page is part of the "15 Things" approach I take to teaching people about the Internet and Web 2.0. 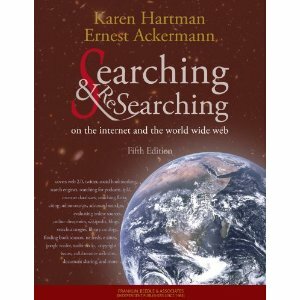 It contains some of the material from Chapter 2 of Searching and Researching on the Internet and the World Wide Web 5th Edition. Google's Search Wiki is no longer available! Take a look at http://www.google.com/support/websearch/bin/answer.py?hl=en&answer=115764 for more information form Google. You can use star results for similar results. Here's a quote from the Google page referenced previously, "SearchWiki allowed you to customize your Google Web Search results by ranking, removing, and adding comments to them. While the commenting and deleting features of SearchWiki are no longer available, you can now star results that you like and see any actions that you previously made with SearchWiki." Nathan Grimm, the program manager of SR Education Group recommended "Boolean Search Login Explained". The site is well done, very useful, and highly recommended. Give it a look. The World Wide Web is an immense collection of valuable information generated by such organizations as universities, corporations, hospitals, associations, and government agencies. Most countries and several languages are represented on the Web. In addition to this, hundreds of thousands of individuals, such as scholars, students, doctors, librarians, teachers, and virtually anyone who wants to contribute to this vast accumulation of resources, are adding their pages to the Web every day, all over the world. Finding information on the World Wide Web is becoming easier all the time. There are two basic ways to accomplish it: You can either browse or search directories, or you can search by keyword in search engines. Browsing directories can be a very effective way to find the resources you need, especially if you’re sure of the general information you’re seeking. Directories index neither all of the pages in the World Wide Web nor all of the words that appear in the Web pages they catalog, however, so if you need specific information, a search engine is the tool you’ll want to use. Search engine databases aim to cover as much of the Web as possible, and most of them index every word in each Web page. A directory would be more likely used if we were looking for general information; for example, resources on the AIDS virus. Directories depend on human beings to create and maintain their collections. Directories are the best place to go to for subject guides, reference works, and specialized databases. Some directories are similar to traditional libraries, in that the information specialists who manage them select and catalog the Web pages that are included in their directories, much as librarians select and catalog materials that are included in their libraries. Search tools are beginning to offer new ways of finding and sharing information using Web 2.0 technologies. For example, some search engines are using visuals and making it easy for the user to share useful Web sites with others.